Atlanta’s manifold of parks make for plenty of land to exercise and soak in fresh air and sunshine, especially before the winter frost rolls in. Now, the latest obsession — yoga — is taking over the city’s greenspace one colorful mat at a time. And even better, it’s usually free. While outdoor yoga sessions tend to hibernate during the coldest parts of the year, the remaining months offer several yoga events to send summer and fall off on a high note. King of Pops Free Yoga in the Park began with a few pop slingers taking a moment of ethereal escape and quickly became a local sensation. 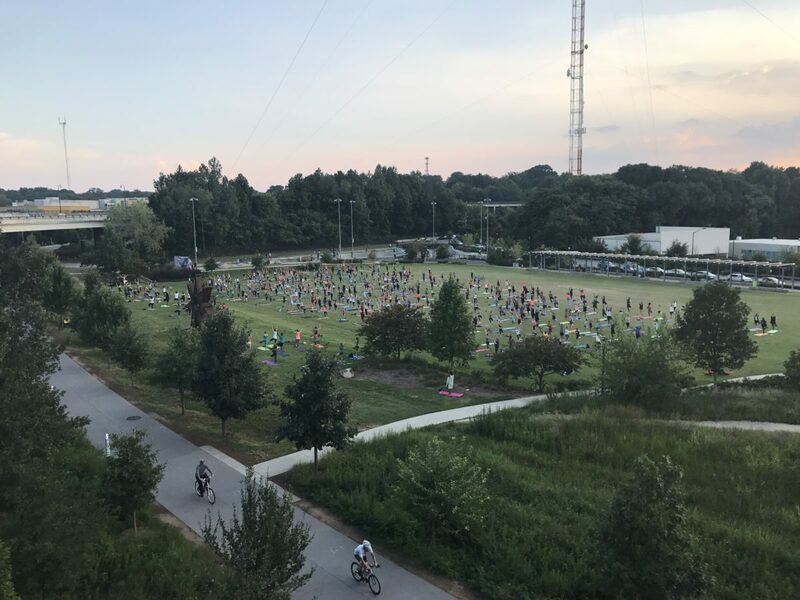 With up to 1,000 attendees each week, King of Pops Free Yoga is currently the largest outdoor yoga option in metro Atlanta. 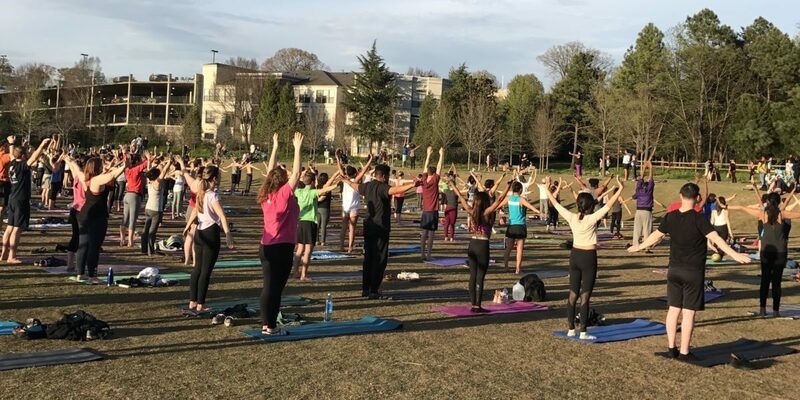 Now, other free yoga phenomenon including Yoga in the Park, Yoga on the BeltLine, Free Yoga at Woodruff Park, and more have joined the journey to enlightenment. The practice of yoga dates back as early as 1500 B.C.E., though historians are not entirely sure of the exact time the notion or practice of yoga began. But one thing is for sure — it’s here, and it’s here to stay. Diego Torres runs the King of Pops free yoga sessions, and says yoga became increasingly popular across metro Atlanta in the early 2000s. 6 p.m. Every Tuesday through Oct. 30. Historic Fourth Ward Skatepark, 66 Willoughby Way N.E. Each week, Torres makes sure the field is booked, the instructor is on deck, and the calming vibes are flowing. The yoga sessions began around 2013 when King of Pops cart pusher Charlie Baxter Graham was in the process of becoming certified in yoga. The King of Pops intimate after-work gathering became open to the community, welcoming passerbyers to join. And each week, the numbers continued to grow. Though King of Pops is often approached for sponsorships by businesses, Torres says the free yoga will remain the way it is — unsponsored and casual. The current instructor is Siha Collins, founder of Yellow Mat Yoga. King of Pops free yoga will run through Oct. 30 and start back this spring. Woodruff Park, 91 Peachtree St. N.W. Proudly sponsored by Atlanta Parks and Recreation, Woodruff Park is hosting free, 60-minute yoga sessions every Saturday through October. The meditative practice will specifically be vinyasa flow, and incorporates sun salutations through the practice. This particular flow is the most popular form of yoga and is used among beginners and advanced practices alike. In vinyasa yoga, each movement is a synchronized breath, which acts as an anchor while moving from one pose to another. Common poses include the upward facing dog and downward facing dog. No registration is required, but attendees must bring their own yoga mat. 3 p.m. Every Sunday. Oct. 7 – Nov. 18. Thanks to the Atlanta BeltLine’s Free Fitness Program, several free yoga options are available quarterly for relaxation and escapism. Last year alone more than 400 free fitness programs were offered, all taught by certified instructors. Classes are held far and wide across the BeltLine, from the Westside, Adair Park, Historic Fourth Ward Park, and more. Since the BeltLine runs through several different neighborhoods, the wants and needs of each community can vary. The next calendar will be unveiled in October and will run through December. As of now, Restorative Yoga and Outdoor Yoga at the BeltLine are confirmed, though additional classes may be added. Weston says on average, around 25 people attended the yoga sessions. Outdoor yoga classes will cease in December and rev back up in March. For a complete list of available classes, updates, and sign ups visit the Atlanta BeltLine partnership website. 6:30 p.m. Monday, Sept. 24. Park Tavern Meadow, 500 10th St. N.E. 6:30 p.m. Monday, Oct. 8. Park Tavern Meadow, 500 10th St. N.E. 6:30 p.m. Monday, Nov. 12. Park Tavern Meadow, 500 10th St. N.E. 6:30 p.m. Monday, Dec. 10. Park Tavern Meadow, 500 10th St. N.E. Amber Barry of Westside Yoga welcomes guests to a evening of zen. Even more calming is that it’s free! Each month, Westside Yoga offers community classes in the Park Tavern meadow. Regardless of the cold or rain, the classes must go on and will be moved indoors to the Piedmont Room. To keep the calming evening going, guests 21 and up are given a drink ticket for a beer of choice, on the house. Piedmont Park, 10th St and Charles Allen Drive N.E. Colony Square, 1197 Peachtree St. N.E. 6:30 p.m. Wednesday, Nov. 14. Well folks, 2018 is the year of the dog. That being said, Dancing Dogs Yoga Atlanta is in full swing and offering a variety of yoga classes all year. The studio has reached out to the community and now offers a few free classes around town. Additionally, first time visits to the studio on a Friday means a free session.